The person responsible for managing the Cracker Barrel Old Country Store Facebook pages is wading his or her way through a mine field of internet users who want justice for Brad's wife. If you haven't heard about this story, here goes. A Milltown, Indiana man named Bradley Byrd claimed his wife, Nanette, was fired from the Cracker Barrel in Corydon, Indiana on his birthday after 11 years of service. 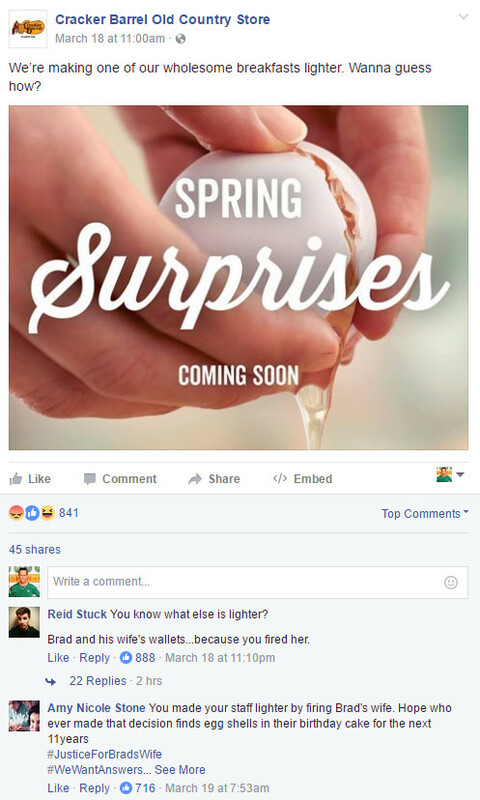 Byrd posted a question on Cracker Barrel's Facebook page asking them, "Why did you fire my wife?" From there, the internet took over. Visitors to the Cracker Barrel Facebook page are unable to post on the wall, so they've turned to the company's posts to find out what happened and to show their support for Brad's wife. Some of the comments are quite funny. 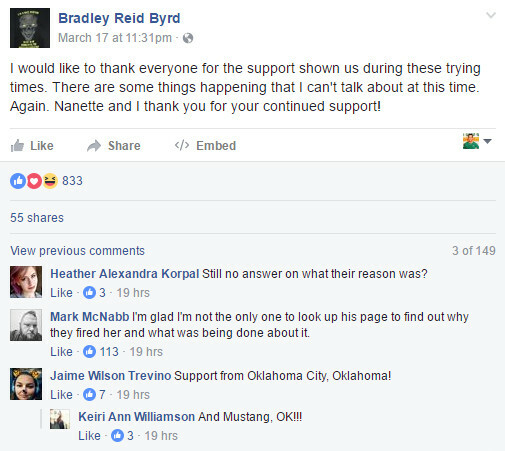 Byrd has posted on his Facebook page a few times since the firing which appears to have happened in late February. As you can see in the picture below, he's even getting support from the Sooner state. Cracker Barrel has not commented about the termination, most companies don't answer questions regarding a person's departure, but that surely won't stop the internet from searching for #justiceforbradswife in the meantime. It won't stop Byrd either, as he pointed out in his post Thursday morning.